Recent studies show roughly 36% of U.S. adults (an estimated 88 million individuals) fall into the category of unbanked or underbanked. The question is not only how to tap this previously overlooked market, but also to how to best serve the unique needs of this growing segment of the population. Deriving profitable results from the unserved and underserved market requires an understanding of their needs, along with products and processes that meet the needs of the customer, as well as those of the organization. eCredable is uniquely positioned to help creditors meet the needs of this market by enhancing their value proposition to new customers, and to drive revenues with a compelling solution that is a win/win for the organization and for the consumer. The underbanked and unbanked market represents significant growth opportunities but evaluating credit risk has always presented a stumbling block to reaching this significant market segment. Alternative Credit databases have traditionally contained only a small and random sampling of the staggering amount of available Alternative consumer payment data. The majority of consumer Alternative Credit data is unavailable through any method other than by manual verification with the account holder, an option too resource intense for the average financial institution or service provider. The AMP Credit Report® provides a simple and cost effective way to evaluate any consumer’s Alternative Credit history. The AMP Credit Report compiles a consumer’s verified alternative bill payment accounts into a traditional credit report format for an easy single document review, and eliminates the costly and laborious verification process on the part of the creditor. 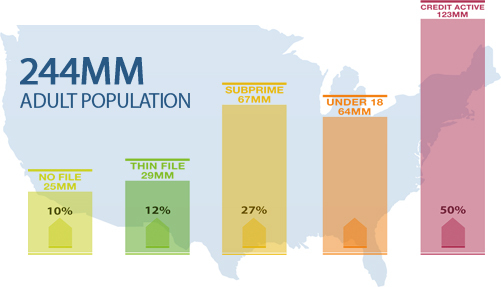 The AMP Report meets or exceeds the guidelines established by the GSE’s, as well as the standards for the verification and reporting of Alternative Credit established by the National Credit Reporting Association (NCRA). All verifications are performed and fully documented by a nationally known third party credit verification agency that is a member of the NCRA and the Consumer Data Industry Association (CDIA). 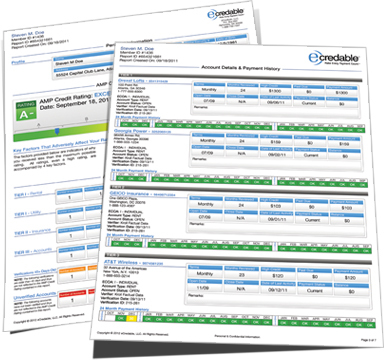 eCredable’s proprietary AMP Credit Score® provides an A - F rating to predict an applicant’s likelihood of default over the first two years of an account’s life cycle. The AMP Credit Score can predict creditworthiness for applicants that have little or no traditional credit history based on the payment patterns of their Alternative monthly payment obligations. The AMP Score model is based on mathematically sound risk modeling principles to provide the most accurate rating of the consumer’s verified payment history presented in the AMP Credit Report. Believing that the single most important element of a consumer’s financial life, their credit standing, should be easy to understand and not shrouded in mystery; we have purposely chosen to make the AMP Credit Score model very transparent to the creditor and to the consumer.